National Guard member 1st Lt. Andrea Lewis is the daughter of a 14-year veteran Navy pilot and a Delta Airlines flight attendant. It only stands to reason, therefore, that serving in the military and becoming a pilot herself was a logical course of action. Sure enough, that’s what she’s set to do when she takes off for her first flight out of Robins Air Force Base in Georgia. But Lewis’s first flight will be more than just a momentous flight for her. For the Georgia National Guard, it will be a barrier-breaking moment. 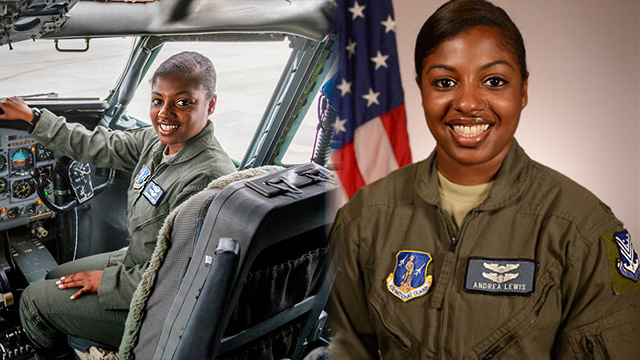 Lewis’s first flight with the National Guard will make her the first black female pilot in the branch’s history. With just 30 percent of the 350,000 National Guardsmen in the fiscal year 2016 listed as minorities—and just 17 percent of them listed as women—it’s already a branch where being a black woman is a rarity. To become a pilot as well, completing one of the most rigorous training programs in the military, is an incredible feat. Lewis felt like this was her destiny, though. In 2010, she became the second civilian in the history of the Air Force to be hired as an Air Force flight attendant, hoping to follow in both of her parents’ footsteps with the job. After her father died that very same year, though, she realized that being a flight attendant alone wasn’t her true calling—she wanted to do what her father had done instead. She was accepted by the Georgia National Guard to begin her training, then hired by the 116th Air Control Wing. It took years of training and discipline, but then in April 2017 she officially earned her wings. Now, she just has to take off for her first official flight—and with a deployment already confirmed, she’s just moments away from going down in history. She’s thrilled about serving her country. But for Lewis, it’s also about motivating children with her success, showing them all that they can dream and achieve.